Wolfe Tone Park is situated in the middle of Dublin on the grounds of the Church of St. Mary’s alongside the old Jervis Street Hospital. Though many pass by and over the space between the de-consecrated Church and an old industrial building few think about what lies beneath. The abstracted diagonal paving with its sparse planting and scattered remnants of headstones was once and remains a graveyard. 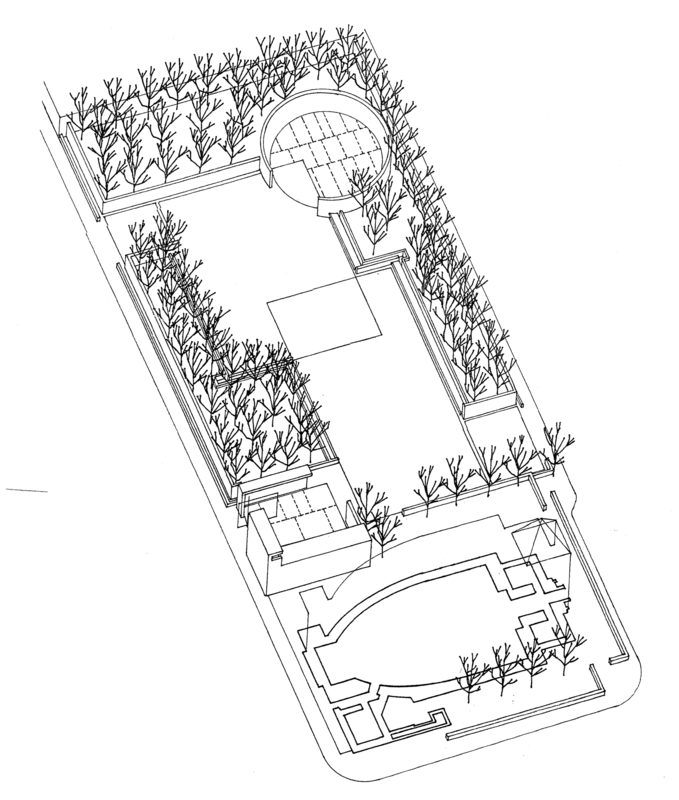 An international design competition was held in 1998 to reconfigure the enclosed park of stone walls, iron railings, paths and grassed over graves. Even then the original headstones had been aligned along the boundaries facing into the space inside. The original stone walls and railings identified the sacred boundary and provided minimal environmental protection from the wind and traffic noise. The solutions that found favour with the jury converted the bounded space to an unbounded non space, leaking to the street and the surrounding spaces. Originally the intention was to bring St. Mary’s into the composition but that remains isolated. Critically however the issue of the dead remained silent in many of the submissions as the graveyard is purported to hold cholera victims with many laid close to the surface. Instead of revealing the interred it was considered more sensible to leave them where thy lay and move the remaining stones to the shaded end of the new space, leaving some to be presented along the western flank to wear away underfoot. Our approach to the Wolfe Tone Square Competition was diametrically opposed to the washing away of this memory. Instead we sought to honour the dead, and the living. 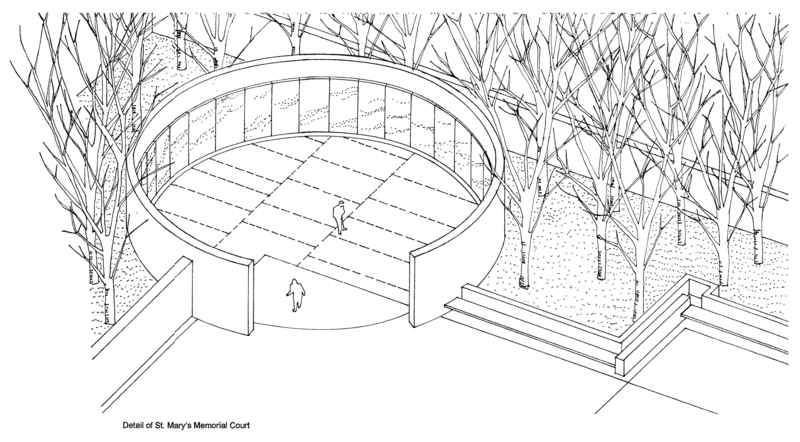 With the additional request to honour Wolfe Tone we split the honorific aspects of our interpreted programme in two contrasting courts connected with spaces for the living visitor. The overall plan for the Square would also recognise the significant environmental problems that currently exist. The prevailing winds from the South West and West transverse the nearby buildings before hitting the Jervis Street hospital Building and directed downwards make for an uncomfortable location at best. 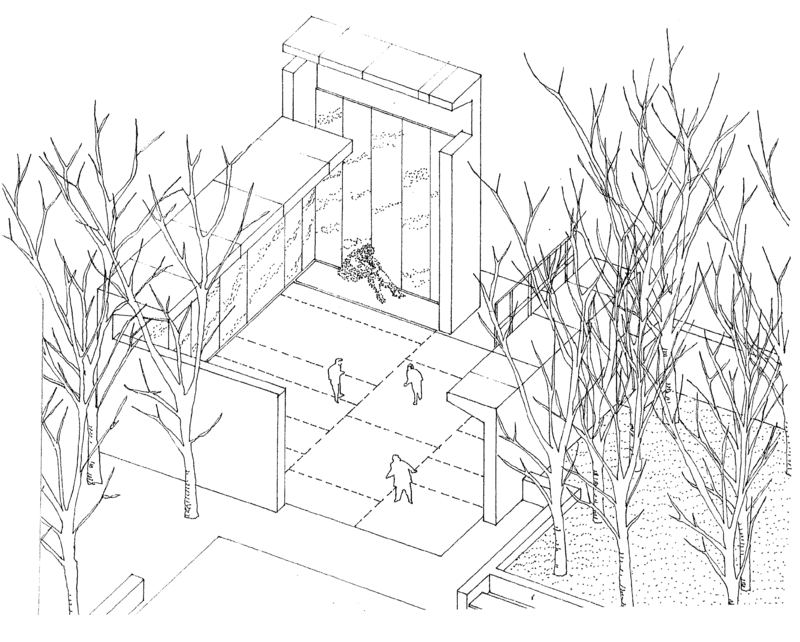 Our proposal sought to enhance the previous barrier’s tendency to shelter the space by including a system of screening with Birch Trees in raised platforms to break up the laminar flow of the moving air as well as a mask to the traffic noise on either street. Coupled with an integrated seating and water system the visitor would be enclosed ion a place of calm reflection necessary in today’s world. The square would also be capable of being closed at certain times to ensure that the place was preserved as a place of respect rather than a place of entertainment, a temptation that is all too often taken up in urban design schemes. As the council authorities seek to address the limitations of the current arrangement there is a plan to convert it back to some sort of grassed surface. As people, re-inhabit the space, as they sit on the grass, as they lounge on those rare days of summer and lie back on the grass they will not know of those that lie barely a few feet away beneath the ground.